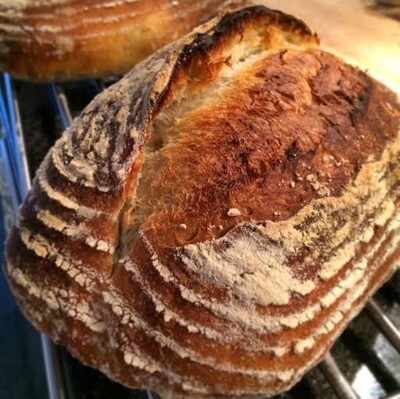 4 classic wheat sourdough levain breads. Goes well with almost everything - breakfast, lunch and dinner! 3 new breads. A more compact, exclusive bread filled with aprictos, raisins and figs, as well as hazelnuts and walnuts. Slice it as thin as you can and enjoy it with (blue) cheese and some marmelade! Delivery time: Friday 9th October between 2 - 4 pm (I can leave it in your post box if you're not home) in the city of Basel. Engelberg evening delivery is also possible! 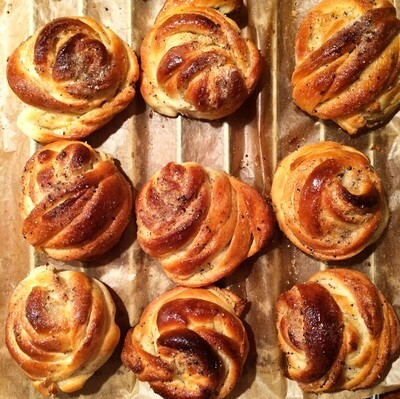 Running baker: Cardamom rolls, Breakfast delight and Solhagas vallmo! 2 "Breakfast delight" - wheat/rye sourdough bread with lots of seeds, apricots and cranberries. Great way to start your day! 3 "Solhagas vallmo" - a smooth wheat bread with sourdough and poppy seeds - like the airy, light buns I longed for as a child! Delivery time: Friday 18th September between 2 - 5 pm (I can leave it in your post box if you're not home) in the city of Basel. Engelberg evening delivery is also possible! Late announcement - but there will be bread tomorrow! 3 "Seasonal Specials" - a wheat sourdough bread with Bärlauch/wild garlic and sea salt. Add some mustard and ham - that's your Friday dinner! Delivery time: Friday 17th April between 2 - 4 pm (I can leave it in your post box if you're not home). Evening delivery to Engelberg possible! PS. I am in the process of establishing a bread range and naming all my bread. The dark, sweet bread this week still has no name...give me a good suggestion and the winner gets a free bread next time he/she orders! Brev fran bageriet is getting a new look! 4 "Rustic (and a bit drunken) Rye" - sourdough bread with spelt and rye flour, whole rye seeds, yoghurt, sunflower seeds, flaxseeds, sesame seeds, pumpkin seeds, and a dash of beer (for that deep, sweet malt taste). This bread keeps you going for long and is best enjoyed in thin slices. It keeps well for about a week if wrapped in a cloth! Delivery time: Friday 10th April between 2 - 4 pm (I can leave it in your post box if you're not home). Evening delivery to Engelberg also possible! Running baker on Friday 27th Feb! 3 sourdough breads with spelt flour, roasted hazelnuts and lovely sweet apricots. You'll like it! 3 special sourdough breads with whole einkorn seeds and kamut flour. Two ancient wheat types which deserve attention! Delivery time: Friday 27th February between 2.30 - 4.30 pm (I can leave it in your post box if you're not home). Evening delivery to Engelberg also possible! I believe my bread turns out better if I love every ingredient in it. Therefore I strive to use organic and locally produced products, and ingredients I find during my travels. Flour and grains: To the extent possible I use flour and grains from a mill outside of Basel - Mühle Maisprach. The grains are produced near to the mill, which has been run by the same family since the 17th century. The flour I use most (wheat, rye, and spelt flour) is from their organic line. Special flours (e.g. durum, emmer, kamut, and buckwheat flour) are not produced completely organically, but are IP-Suisse-certified, which encourages organic production and has pretty strict guidelines for production. I sometimes buy flour and grains from other places, and then always organic. Seeds and nuts: I try to buy only organic seeds and nuts (sunflower seed, flax seed, sesame seed, chia seed, hazelnuts, walnuts, almonds). I also tend to collect nuts from travels, and for example the times I use macadamia nuts they are always from South Africa, purchased during my travels to Africa. Dried fruit: Apricots, raisins, plums, cranberries, and blueberries I buy organically to the extent possible, sometimes when not available I occationally buy non-organic. Dried mango I always buy during my travels to Africa. Fresh fruit: in season I sometimes use plums, apples, and pears in my breads, and often I buy this fruit at the mill, or another local producer. If organic, even better! Sugar, syrup, honey: I use only organic sugar. Syrup I always buy in Sweden, I haven't found a good alternative in Switzerland yet. Honey is something I tend to collect and I have various kinds at home from travels around the world, some of them organic. Salt and spices: I use organic sea salt in my bread. Spices like caraway, anise, and cardamom I buy organic when I come across it, and often during travels. Other ingredients: I always try to buy organic and locally produced ingredients for my bread, I however sometimes replace it with the best available alternative if I can't find what I am looking for. If you have any questions about my ingredients - let me know! Blueberries and seeds on Friday! 3 "Frölosofi" - wheat and rye sourdough bread with roasted flax seed, sunflower seed and sesame seed. One of my own favourites! Delivery time: Friday 6th February between 2 - 4 pm (I can leave it in your post box if you're not home). Evening delivery to Engelberg also possible! 3 rye sourdough breads with a sweet touch of plums and raisins, covered in roasted sunflower seeds. a nice complement to your Sunday stew! Delivery time: Friday 23rd January between 2 - 4 pm (I can leave it in your post box if you're not home). Evening delivery to Engelberg also possible! This year I will run at least 20 delivery rounds and this is the first one - don't loose out! 4 durum pavé breads with wheat sourdough, a crispy crust and golden crumb. Your Saturday breakfast will glow! 3 tasty wheat sourdough breads with roasted hazelnuts, raisins, figs, apricot and apple. 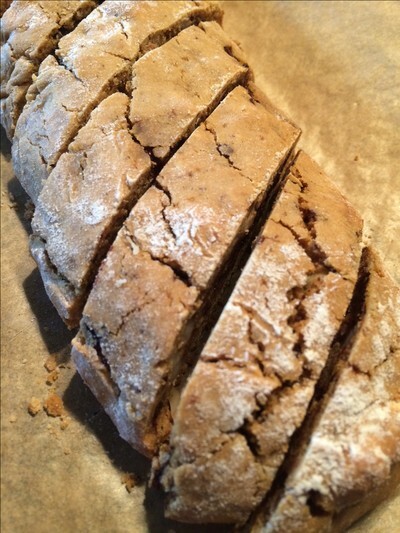 A fruity, delicious bread for toasting! Delivery time: Friday 9th January between 2 - 4 pm (I can leave it in your post box if you're not home). Evening delivery to Engelberg also possible! I ran 12 Running Baker rounds and gained new customers. That's one round per month! 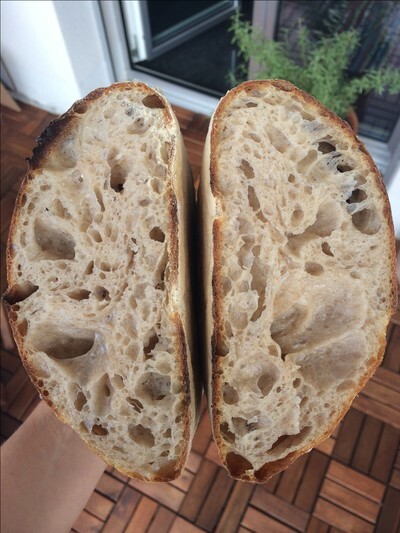 I baked at Surdegskungen for 3 days and learnt a new way to shape loaves, how to push your dough to the hydration limit, and most of all whole load of inspiration and motivation to move forward with my dreams! I wrote an article about how I became the Running Baker for BREAD Magazine (published in the winter issue 2014). Start a subscription now - it is a great magazine for bread lovers! 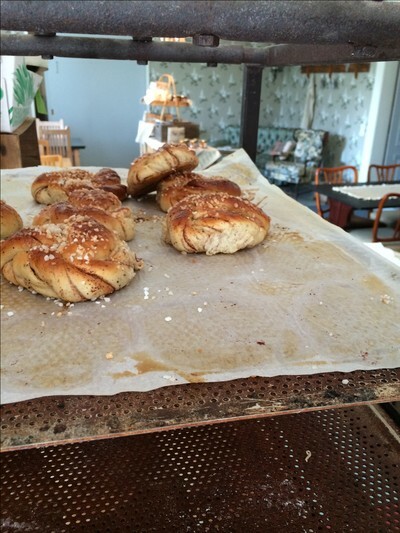 I baked for the first time in a wood-fired stone oven, in a beautiful place up north in Sweden. I gained about 200 followers on my bread-focused Instagram account. Thanks to all of you! I started working on a new logo for my baking business and am now using printed cards for the packaging of the breads - one step closer to a real business! Scale up my baking business, bake in bigger quantities, bake at least twice at events. Run at least 20 the Running baker rounds. That's 1.7 rounds per month! Come up with the formula for perfect loaf of bread - THE bread! That means optimizing my favourite recipes to find that perfect version of the-bread-you-want-everyday. Blog at least one every week and share more recipes with my dear readers. Have a new logo, bringing together the blog and the Running Baker in a better way. 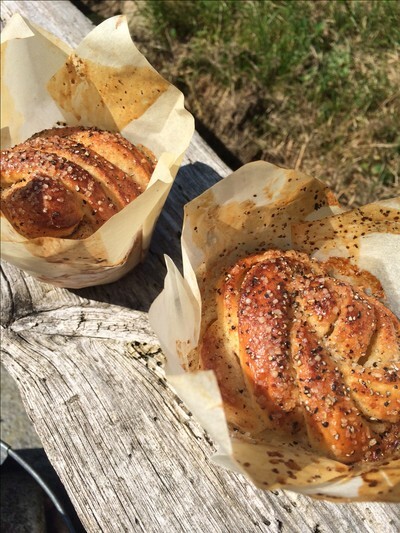 Learn more about Swiss baking culture while living in Switzerland through courses or bakery practice. I hope you continue enjoying what I post and I hope more will join me on the blog and on instagram! 2015 will be a great year! I have been looking forward to another round of The running baker! 3 julmust sourdough breads. As we are approaching Christmas I added julmust and seasonal spices to this wheat sourdough bread - let the Christmas bells ring! Haven't posted anything on the blog for long. Too long. It's been nagging in the back of my head, but somehow I have 't managed to find the time. In any case, I don't want to waste ink on writing about what I HAVEN'T done. Much better energy to write about what I HAVE done. This blog post was drafted on a full plane to Copenhagen. I have headed north to see dear family and friends and, which I am really excited about! What I am also extremely excited about is the fact that I will spend 3 days next week at Surdegskungen (= the Sourdough King!) in Kungälv on the west coast of Sweden. This will be my second apprenticeship in a bakery, and thinking how much I learnt last time, I am so eager to add to me baker skills and experience! 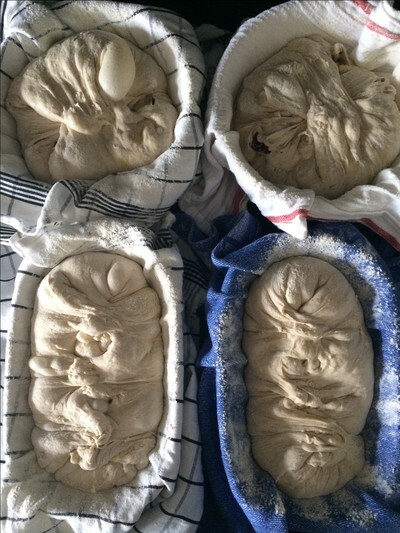 Really, really looking forward to get covered in flour, have my arms aching from kneading doughs and be able to chat about bread all day long with the great guy who started Surdegskungen! Will post pictures on Instagram and on the blog. Before jumping on the flight I made a little excirsion outside of Basel, to meet the guy behind Joy of Gluten, a blog I recently discovered. I was happy to learn that this micro bakery is run just half an hour drive from where I live. 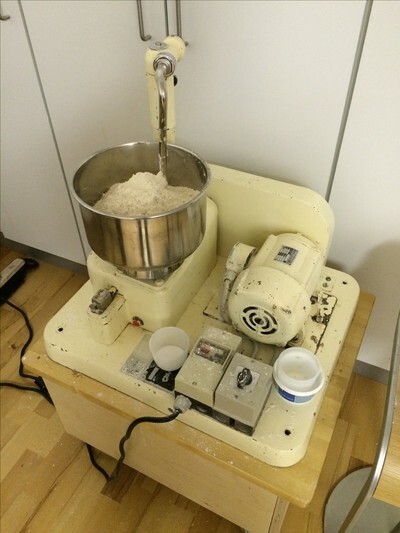 I contacted the man behind the blog and took the chance to meet him on one of his baking days. He has set up a micro bakery in the basement of his house and bakes two days per week for his community. Inspiring!! He seemed to be a master in finding used bakery equipment for a tiny price, and gave me some good hints. Amongst other things he had a fantastic old Diosna dough mixer from the mid-60's with the L-shaped mixing arm you don't see so often on more modern mixers. Daniel referred to it as the one-armed bandit... Great to have found a fellow micro-baker in the area! In any case, peace out, soon going down for landing! 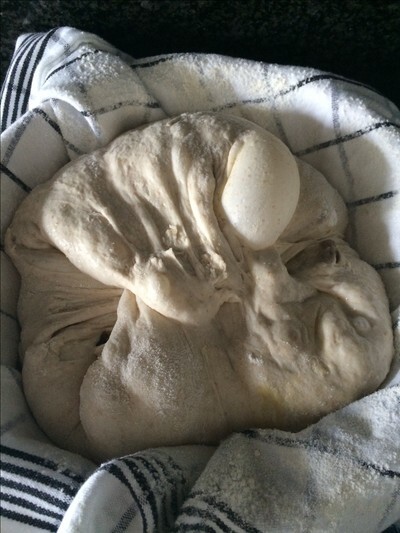 - 3 Pavé - this classic bread needs 48 hours to develop a rich and full texture. 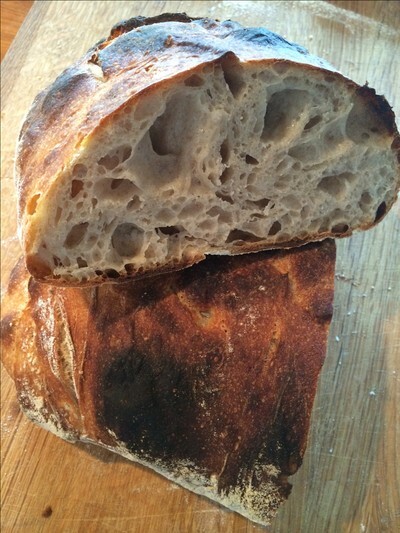 Made of wheat and rye flour, a special sourdough, water and salt. As simple as that! The running baker - 6 breads for Friday! - 3 "Frölosofi" - wheat and rye sourdough bread with flax seed, sunflower seed and sesame seed. One of my own favourites! - 3 wheat and rye sourdough with spelt flour, apricots and roasted hazelnuts - have it with a warm cup of tea now that fall is here! Pre-heat the oven to 175°C. Mix butter, sugar and vanilla in a bowl. Add the eggs and whip into a thick batter. Chop the nuts and chocolate. Add it into the batter. Mix flour and baking soda and add into the batter. 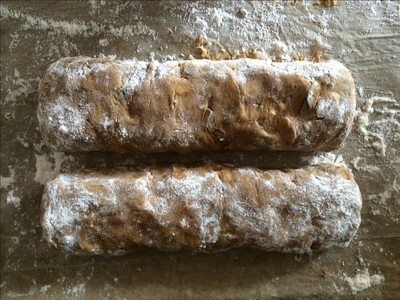 Turn the batter onto a floured baking paper (the dough is a bit sticky) and shape into two 25 cm long loaves. Place the loaves on a baking tray and bake until golden brown, ca. 25 min. Take the loaves out and let cool in room temperature for one hour. 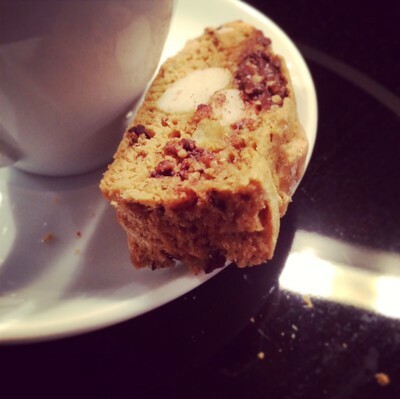 When cooled, cut into biscotti, about 2 cm thick pieces. Turn the oven to 75°C. 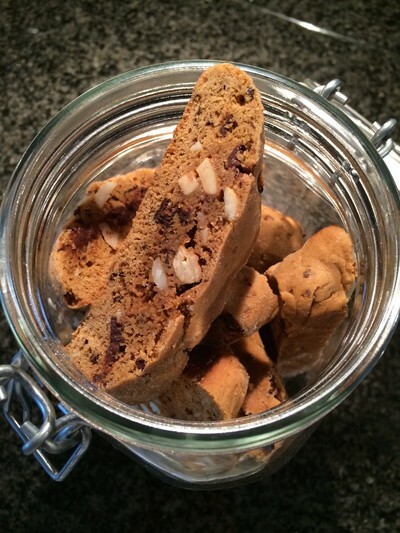 Place the biscotti on a baking tray and dry them in the oven until dry, ca. 1,5 hours. I am now officially changing the language of this blog into English. Headings and other text will be changed gradually. Previous postings will remain in Swedish. The reason for this change is to enable for example my The Running Baker customers here in Basel to also read the blog. I sincerely hope that my Swedish readers will continue to visit the blog despite the change. In the recipes I will translate "difficult" ingredients into Swedish. I am back from Africa! 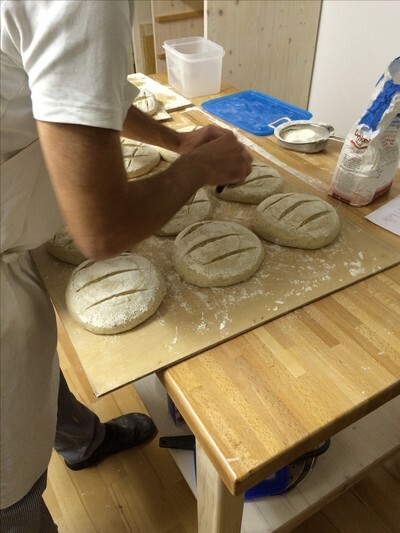 Book your Friday bread! 3 st Afrikainspirerade surdegsbröd med macadamianötter, mango och ekologisk avocadohonung från Tanzania - hello Africa! 2 st ljusa vete- och dinkelbröd med surdeg och vallmofrön - som frallorna man fick när man var liten! 3 Africa-inspired sourdough breads with macadamia nuts, mango and organic avocado honey from Tanzania - hello Africa! 2 wheat and spelt sourdough breads with poppy seed - like the buns from the bakery of your childhood (at least in Sweden...)! Bättre sent än aldrig... Lovade på instagram (följ mig gärna där ifall du inte redan gör det!) i förra veckan att jag skulle lägga upp recept på ett bröd som blev riktigt, riktigt bra. Det var ett ljust bröd på vete och lite råg, gjort på en riktigt bubblig levain/fördeg. Jag har lagt upp recept på den här typen av bröd tidigare, t.ex. Basellevain (bakat på vildjäst) men jag tycker att detta blev snäppet bättre. Rustikare på något vis och en bättre balans med syran och smaken. Jag har haft lite problem med den typen av bröd innan, har inte fått de riktigt så sega och håliga som jag velat, men nu känns det som att jag knäckt koden. Mycket har att göra med momentet då degen ska delas upp i mindre bitar och läggas i korgar. Har tidigare jobbat för mycket med degen så att luften försvunnit ut, och brödet har därför inte blivit lika luftigt som jag velat. Nu har jag hittat en teknik som funkar. Så, här kommer alltså receptet (något utförligare än vanligt så att ni också får känna YES - det bästa! ), ett resultat av flera olika recept och tekniker som jag plockat ihop till ett som jag tycker ger det bästa "levain"-brödet. Hittills iallafall. Blanda mjölet, vattnet och surdegen väl (riktigt vispa ihop den, det är viktigt att luft kommer ner i blandningen) i en skål. Täck med plast och låt stå i rumstemperatur över dagen, ca. 9-10 timmar. Blanda alla ingredienser utom saltet i hushållsassistenten i 3-4 minuter (ingredienserna behöver bara blandas, inte knådas). Täck bunken och låt vila en knapp timme i rumstemperatur. Tillsätt saltet och kör hushållsassistenten i ca. 1 min. Täck bunken och låt vila en halvtimme i rumstemperatur. Smörj (jag använder rapsolja) en plastlåda med lock och lägg över degen i lådan. Vik ihop den till ett paket, vänd på degen och lägg skarven nedåt (den ska vara som ett spänt paket). Låt degen vila under lock i en timme i rumstemperatur. Upprepa vikningen och låt degen stå framme och jäsa i rumstemperatur i 2-3 timmar (den ska ha dubblat sin storlek). Ställ in lådan med degen i kylen över natten (ca. 8 timmar). Ta fram lådan med degen ur kylen och låt den stå framme i rumstemperatur. Lägg in stenplattorna i ugnen (ifall du bakar med sådana) och sätt på ugnen på 275 grader. För att stenplattorna ska bli ordentligt varma så behöver min ugn stå på i en timme innan jag gräddar bröden. Mjöla under tiden 2 st jäsningskorgar ordentligt med mjöl (till dessa bröd vill jag ha en slät yta, så jag lade i handdukar i korgarna). Mjöla bakbordet och stjälp upp degen. Dela degen i två delar och vik försiktigt in kanterna på degen mot mitten utan att trycka ut luften. Lyft med hjälp av en degspade över degen i korgarna. Eftersom det är en relativt lös deg ser degen nu ospänd ut i korgarna och ligger inte så snyggt. Det löser du genom att ta tag i kanterna på degen och lägga dem i kors över varandra (se bild nedan) - du "syr" liksom ihop degen med sig själv. Täck över korgarna och låt jäsa i en halvtimme i rumstemperatur. Stjälp upp bröden med skarven nedåt på en mjölad brödspade och skjutsa in dem i ugnen. Spruta in rikligt med vatten med en blomspruta (undvik att spruta direkt på bröden). Sänk värmen till 250 grader. Grädda bröden i 20 min. Sänk sedan värmen till 220 grader och grädda dem tills de blir ordentligt bruna och uppnår 98 grader, vilket brukar ta ungefär 10-15 min till. Öppna luckan ett par gånger och vädra mot slutet för att bygga upp skorpan. Ta ut bröden och knacka på dem, de ska låta ihåliga. Låt svalna på galler. Låt mig gärna veta ifall detta recept funkade för dig. Hjälper gärna till att "trouble shoota" ifall du inte blir nöjd med resultatet. Here I go again! The running baker's first delivery after the holidays! 3 st ljusa vetesurdegsbröd bakade med levain (fördeg som jag sätter redan imorgon bitti) - detta är brödet jag tänker på när jag säger surdegsbröd. Rostat med smör, ost och marmelad till frukosten är det svårslaget! 3 wheat sourdough breads baked with levain (a starter I prepare alreadz tomorrow morning) - this is the bread which I think abut when saying sourdough bread. With butter, cheese and marmelade nothing can beat it! Mata surdegar, köpa mjöl, mata surdegar, planera recept och så mata surdegar igen. Det är vad som händer på min bakfront just nu. Kom tillbaks till Basel igår efter 4 veckors semester med roadtrippin' genom ett antal europeiska länder på vägen upp till Sverige och sen 3 veckor i ett extremt somrigt och soligt Svedala - tänk om alla svenska somrar vore så! Lite bageri-span har jag ju alltid påslaget vart jag än reser, men jag hade inga specifika bageristopp på vägen upp till Sverige. Kunde dock konstatera att holländarnas huvudstad skulle må bra av ett riktigt bra surdegsbageri och med tanke på hur grymt trevligt Amsterdam var så blir jag riktigt sugen på att flytta dit! I Sverige hann jag med att besöka Gårdsbageriet i Idala - ett bageri jag länge varit sugen på att besöka sedan jag praktiserade på Bolins Bageri där jag hörde talas om det. Besökte även för första gången Åland och hittade mysiga Johannas Hembakta och det välskötta Anderssons Gårdsbageri. Fick med mig åländskt svartbröd hem, det ska visst hålla i månader och doftar som att det fullkomligt badat i malt. Fyllde även på förråden med sirap, muscovadosocker och farinsocker eftersom jag fortfarande inte hittat det här i Schweiz. Bakningen har legat helt nere under semestern och väl hemma igen ser mina surdegar riktigt missmöjda ut. Regelbunden matning och mucho amor är behandlingen de genomgår för tillfället. Måste få till en sväng till kvarnen också och fylla på i mjölförråden. Sen är jag back on track!